Community | Park View, D.C. 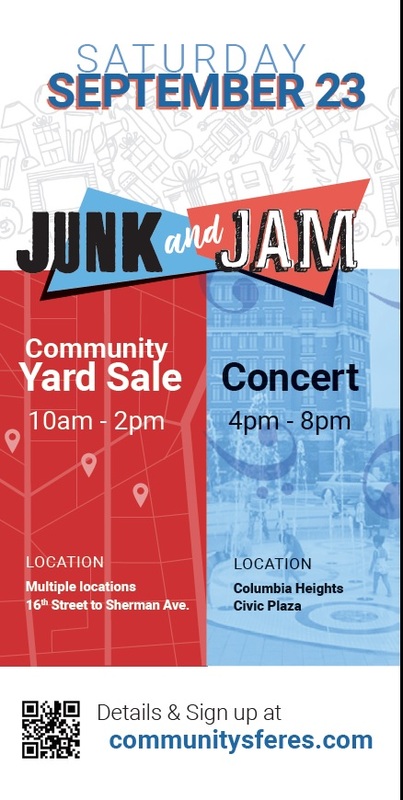 This Saturday (September 23rd) is Junk and Jam in Columbia Heights, a day full of great community activities! It is a great chance to get out, meet people in the community, and help improve public safety by getting to know neighbors! The day begins with a multi-family yard sale that will stretch along Monroe Street from 16th Street to Sherman Avenue starting at 10 AM on Saturday, September 23rd. Afterwards, there is a Community Engagement Event starting at 4:00 PM to 8:00 PM on the Columbia Heights Civic Plaza (the fountain @ 14th & Park). It will feature FREE live music, a variety of District agencies, and neighbors!! Music will be provided by our very own local talent: Cosmic Music Collective, Jim Fey, and Nebraska! While enjoying great music, come by and visit with District agencies and civic groups to learn more about the services our city has to offer. Meet with representatives from: Washington Metropolitan Police Dept. 3D, District of Columbia Office on Aging, Department of Energy & Environment, and MORE!! The lower Georgia Avenue businesses are launching First Friday tomorrow, on May 5th, from 6-8 pm. This will be a monthly recurring activity with a growing number of businesses offering specials, highlighting DC artists and musicians. 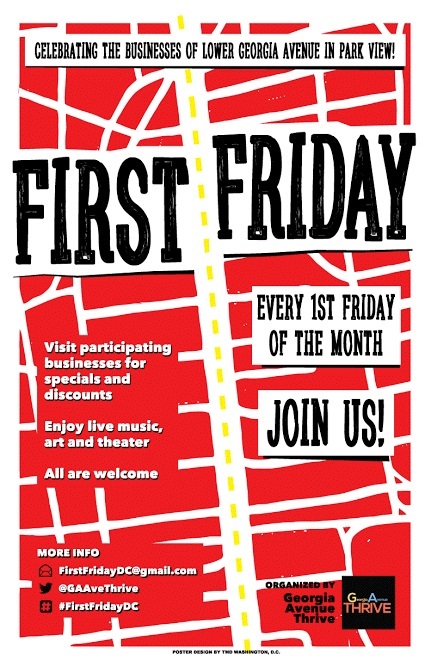 Check out the First Friday Facebook page for more details and a list of participating businesses. 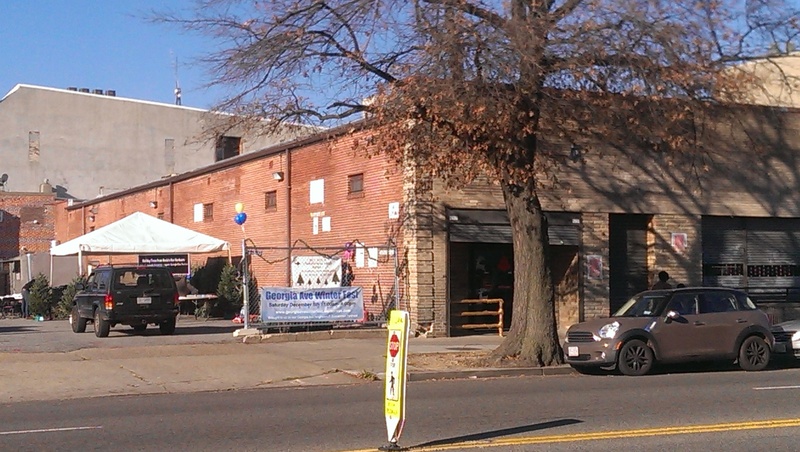 First Friday is organized by Georgia Avenue Thrive, which is partnering with the Petworth Arts Collaborative on this with a vision for a vibrant First Friday from Upshur to Euclid in the hopefully not too distant future. Neighbors beginning to fill in the gymnasium of the school auditorium. 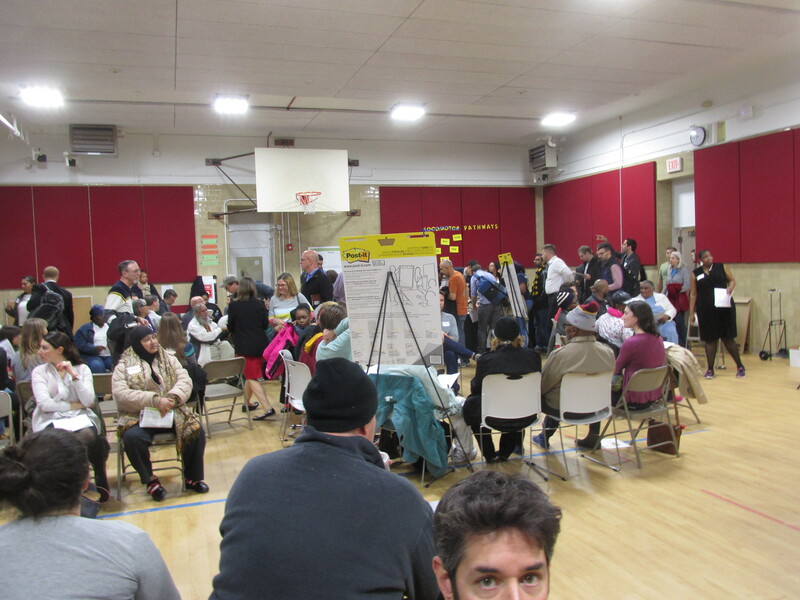 Last night’s community meeting focused on the redevelopment of Park Morton was well attended, with community members overflowing the gymnasium at the Bruce-Monroe @ Park View school. The meeting was set up into two parts. The first was an introduction by New Communities Director Angie Rodgers, who spent about 45 minutes bringing everyone up to date on the history and events leading up to the present discussions centered on redeveloping the Park Morton community. Some of the details were a refresher to those that have already attended previous meetings, but Rodgers stated that it was important for everyone to have the same information. Among the details that were shared were the New Communities commitment to 1:1 replacement housing for Park Morton, the right of Park Morton residents to return and stay in their community, the commitment to creating a mixed income community, and the importance of building replacement housing first. While there were outbursts from some residents from time to time, these were at a minimum and largely occurred when Rodgers was giving an overview on the history and selection of the former Bruce Monroe school site as the build first site. The history included the razing of the school, the city’s longstanding intent to develop the site, and the creation of the temporary park. There was also a brief outline of the commitment to achieve multiple community goals on the site and the entire redevelopment project, have a mix of retail, housing, and park space, and a commitment to develop the park space first so that the community would not be without a park during the entire process. After the introduction, attendees engaged in a series of break out groups. 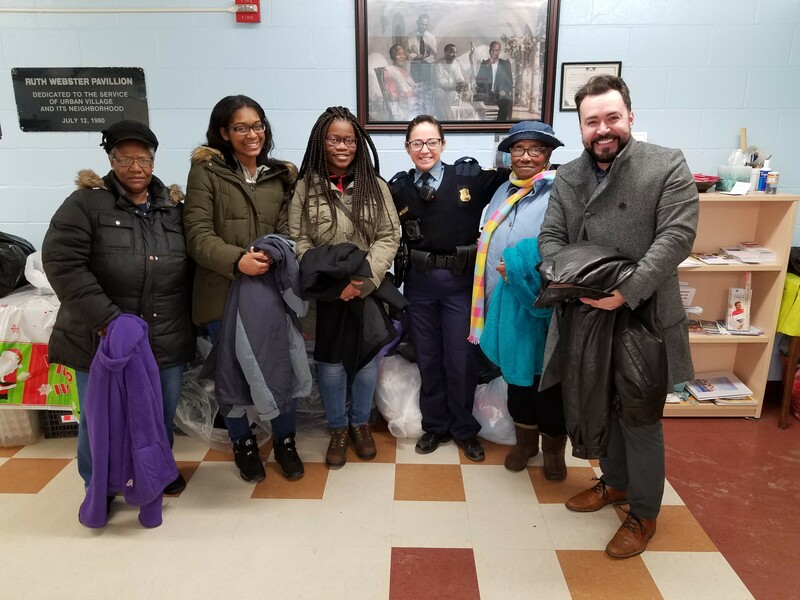 There were eight groups in the gymnasium, and due to the number of engaged neighbors attending the event, two additional groups were formed and organized in the school’s auditorium. Each group focused on three questions — these being 1) What do you like about your neighborhood?, 2) What would you like to see in the future?, and 3) What is your biggest concern or area you’d like to focus on? After each group discussed these questions, they reported out to the entire assembly. Several central themes emerged. Many of the groups reported that they liked the walkability of the neighborhood, its access to public transportation, its residential character while being close to other parts of the city, and its diversity of race, income, culture, and age. Other qualities that were mentioned were the neighborhood’s history and that the neighbors looked out for each other. Cleaner streets, lower crime, better schools, and improved parks were mentioned in response to this question, as were fewer vacant or blighted buildings and an increase in small businesses along Georgia Avenue. What is your biggest concern or area you’d like to focus on? It was not surprising that some of the concerns focused on a desire to see the development proposals that DMPED had received for the redevelopment of Park Morton, or that some residents continue to be concerned about the future of the temporary park at Georgia and Irving. There continued to be concerns related to the community engagement for the redevelopment process and some continued to advocate for the inclusion or use of different vacant parcels along Georgia Avenue. Residents of Park Morton expressed concerns with displacement or the possibility of having to move multiple times rather than once. There was also a concern voiced by some that there isn’t a more detailed plan to review. The meeting ended with more questions than answers, though Director Rodgers stated that the goal of the meeting was to listen to the community and gather questions to be answered in future community meetings. To that end, she stated that the next community meeting is scheduled for Tuesday, December 1st, at 6:30 pm and will be held at the school. There is also a community meeting scheduled for Saturday, December 12th, beginning at 10 am and also to be held at the school. The next Steering Committee meeting is scheduled for December 1oth and will be held at the Park View Rec Center. Lastly, it was announced that a new Web site has been set up where neighbors can stay up to date on upcoming meetings and meeting minutes, which is www.parkviewengage.com and where more official notes from these meetings will eventually be posted.